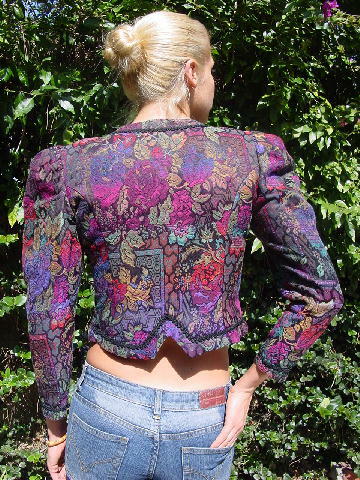 This tapestry evening jacket is a Cachet by Bari Protas. It is 60% cotton and 40% acetate with a 100% black polyester trim which runs along near its outside edges. There are shoulder pads and a 9" deep V neckline with 6 black round buttons down the front and 2 front snaps. It has a waiter's styling in the front and gathering by the shoulder-arm sleeves. There is a floral pattern in greens, yellows, reds, blues, oranges, and black. shoulder to bottom side seam 17 1/4"
shoulder to bottom front tip 20 1/2"
neckline side to side 6 1/2"
bottom side to side 13 3/4"